Quaking aspens add a beautiful aesthetic impact to your home garden but come with some hefty health baggage. While proper care will promote vigorous growth, a variety of diseases are known to plague this tree. Familiarize yourself with infections, what to look for and how to handle disease that arises for healthy trees in your landscape. Quaking aspen trees (Populus tremuloides), also referred to as aspens or quakies, are more likely to avoid or have the capability to fight disease when vigorous in comparison to weakened trees. Grow quaking aspens in full sun exposure as they are not at all tolerant to shade. Quaking aspens prefer well-drained loam soil high in organic content but will fall ill in excessively wet or waterlogged conditions, according to the Utah State University Cooperative Extension. One type of disease that affects quaking aspens is canker disease often caused by the fungus Cytospora chrysosperma. Cytospora canker fungal infection affects the trunks and branches of your aspens, particularly targeting stressed trees, according to the U.S. Department of Agriculture (USDA) Forest Service. Aspen leaf spot is another common disease of the quaking aspen that is caused by the fungus Marssonina, affecting foliage, according to the Utah State University Cooperative Extension. Cytospora canker disease on quaking aspens causes the bark to become an orange color as well as the development of fungal growths in dark orange hues. Cankers or lesions of dead tissue may form on bark with orange borders. Trees suffer from the death of branches, according to the USDA Forest Service. Aspen leaf spot symptoms include the emergence of dark brown spots with light-colored centers that expand and join other spots to form abnormal splotches on leaves. Splotches are dead leaf tissue that become yellow and may lead to tree death if left untreated for several years in a row, according to the Utah State University Cooperative Extension. Additionally, heavy leaf drop often occurs during the spring season, leading to severe decline. For natural control of quaking aspen diseases, remove and destroy all affected plant parts and debris to inhibit the spreading of disease or future infection. Prune your aspen for appropriate sun exposure and circulation as crowding retains moisture, a prime environment for the germination of fungi, according to the Utah State University Cooperative Extension. Sanitize pruning tools between each cut and from use on one aspen to the next to prevent disease transfer. Particularly for cytospora canker that is not treatable with chemicals, avoid injury and the creation of wounds through which fungi invade. Though chemical control is unavailable for cytospora canker, fungicidal treatments are effective on quaking aspens suffering from aspen leaf spot. Use chemicals with the active ingredient chlorothalonil or copper sulfate and lime. Apply sprays by fully saturating the aspen when bud break occurs and once every two weeks until wet weather tapers off into spring, according to the Utah State University Cooperative Extension. 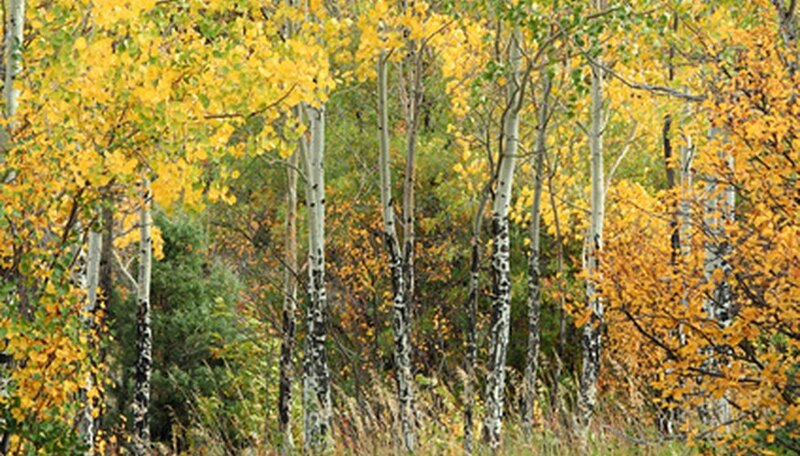 What Is the Care for Aspen Trees?